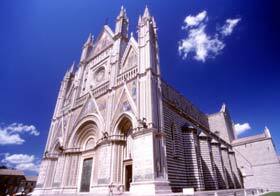 Nicknamed "The Green Heart of Italy," Umbria is nestled next to Tuscany in central Italy. Landlocked, it relies on pork for most of its classic preparations, and its pork butchers are said to be the best in Italy: every scrap of the pig is put to good use, and specialties like Guanciale (the salted and cured meat from the pig's cheek) are tossed into pasta sauces and pots of fava beans or peas. 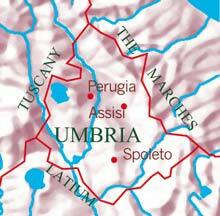 And the region's aromatic black truffles scent many dishes, from delicate polentas to savory cheese breads. This simple but effective Umbrian recipe is a signature dish at Norcia's Granaro del Monte Cooking School. Preheat the oven to 350 degrees. 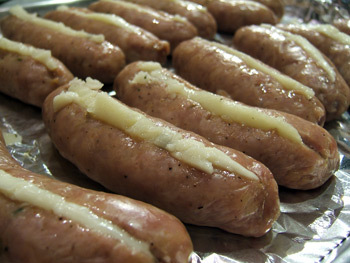 Place the skinless sausages on a roasting pan and bake in the preheated oven 10 minutes, or until almost cooked. Cool 5 minutes. Using a paring knife, make a long slit down the middle of each sausage (but be careful not to cut all the way through-you still want the sausages to hold together). Stuff the slits with the cheese and return the sausages to the oven. Bake another 10 minutes, or until the cheese is melted and the sausages are cooked all the way through. This outstanding Umbrian recipe is from chef Mirella Argilli at Il Panciolle, in Spoleto. Mirella sometimes adds grated Fontina cheese to the truffle sauce. Make the flan: Preheat the oven to 350 degrees. Coat 6 individual (1-cup) soufflé molds with olive oil and bread crumbs. Refrigerate. 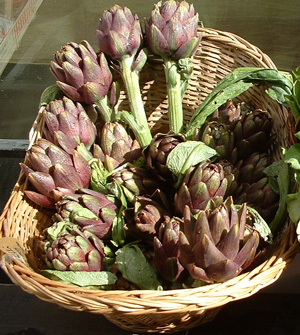 Trim the artichokes; immediately place in cool water with the lemon juice to prevent oxidation. Drain and slice the artichokes, and place in a pan with the broth. Cook until very tender over medium heat. Purée the sautéed artichokes until smooth in a food processor. Place in a bowl and add the Parmigiano, eggs, cream, salt, and pepper. Fill the prepared molds with the mixture and place in a roasting pan filled halfway with warm water. Bake in the preheated oven 25 minutes, or until set. Meanwhile, make the sauce: Melt the butter in a small pan. Add the flour and cook over low heat, whisking all the time, for 2 minutes, or until the flour loses its raw smell. Do not let the flour take on any color. Slowly add the warm milk, whisking all the while to avoid lumps. Season with the salt and pepper and cook until thick, whisking often, about 10 minutes after it reaches a boil. Whisk in the grated truffle and keep warm. 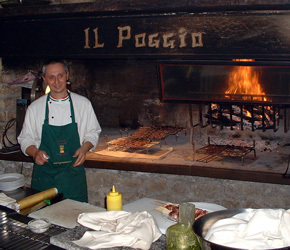 Umbrians are masters at grilling meat and poultry, and have impressive indoor hearths where they can cook over live flames all year long, like in the photo here. I like to marinate the chicken for up to 2 days in the refrigerator if possible; the longer you marinate meat, the more tender it will become, and the better the flavors of the marinade will penetrate. Before grilling the chicken, return it to room temperature; this will help it cook through more evenly. If you grill breasts instead of legs, they will cook through more quickly—avoid overcooking or they will be dry and stringy. Rinse the chicken under cool water, dry it, rub it with 1 of the lemon halves, and place in a large container. Toss with the olive oil, wine, rosemary, thyme, sage, garlic, and black peppercorns; set aside to marinate for 2 hours at room temperature or up to 2 days in the refrigerator. When you are ready to serve, season the chicken with the salt. Heat the grill to a medium-high flame. Place the chicken, skin side down, on the grill. Cook until it is browned on the bottom, about 10 minutes. Turn and cook until the chicken is browned on the other side and cooked all the way through, about 10 more minutes. I first discovered torta al testo in a small Umbrian town years ago. Thin, soft, speckled with brown, it was addictively smoky in flavor, and totally satisfying. 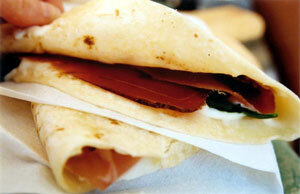 This delicious flatbread is cooked on a hot testo (a pan with a concave lid) in Umbria, hence its name. 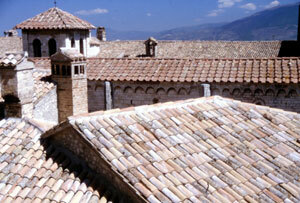 Torta al testo has been made in Umbria for thousands of years. Similar breads exist across central Italy, especially the Marches, where they go by other names. Torta al testo can be eaten on its own, like any other bread, or wrapped around a sumptuous array of fillings: I especially love a dusting of freshly grated Pecorino and a thin slice or two of Prosciutto. I often serve it alongside a platter of antipasto offerings: preserved vegetables, marinated olives, sharp cheeses, salty salumi... try it for an informal get-together with friends and let me know how you like it. 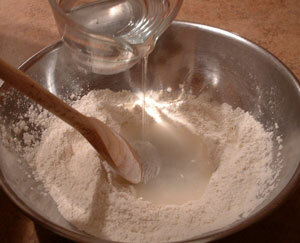 Place the flour, salt, and baking soda in a bowl and mix with a wooden spoon. Gradually pour in ¾ cup plus 1 tablespoon of warm water. Stir with a wooden spoon until the dough begins to come together. If the dough is wet, add a bit of flour; if it is dry, add a touch of water. 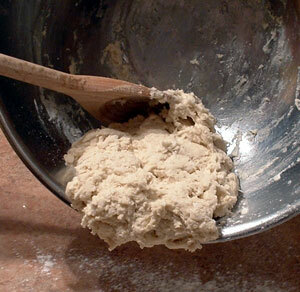 When the dough is soft but not wet, and forms a rough mass around the spoon, it is ready to be kneaded. Turn out onto a counter and knead 5 minutes, or until a soft, smooth dough forms, sprinkling in additional water if the dough is dry or additional flour if it is sticky. 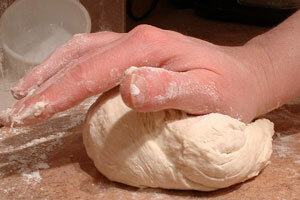 Use a vigorous motion when kneading the dough to ensure that it becomes smooth and supple. 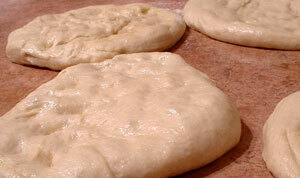 Do not add too much flour as you knead, or the dough will become tough and will be difficult to roll out later. The dough should be soft but not sticky. Shape into a ball, dust lightly with flour, wrap, and let rest 30 minutes. On a very lightly floured counter, cut the dough into 8 equal pieces. Let rest 15 minutes, covered with a towel. Roll out each piece into a 5-inch circle using a rolling pin. Prick each circle 3 times with a fork; this will prevent ballooning as the flatbreads cook. Arrange the dough circles on a very lightly floured tray in a single layer (try not to stack them, or they might stick together). Each dough circle will yield one torta al testo. Cover with plastic wrap to prevent drying while you heat the pan and cook each torta al testo. Heat a griddle (or grill pan if you have one) to a high flame. 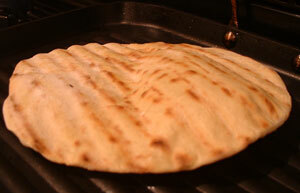 Cook each torta al testo until golden-brown on both sides, about 2 minutes per side, turning once. Enjoy the torta al testo hot, as an accompaniment to cheeses and cured meats, or wrap around a savory stuffing and fold in half. Store leftovers in freezer-safe plastic bags in the freezer up to 1 month, making sure to first wrap each torta al testo in parchment paper to protect it from frezer burn, and defrost in a preheated 350 degree oven for 5 minutes, or until pliable. If you like, brush with olive oil and sprinkle with sea salt before eating or stuffing for additional flavor. The tiny lentils from the Umbrian town of Castelluccio are prized across Italy for their earthy, sweet taste and their ability to maintain their shape even after long simmering. 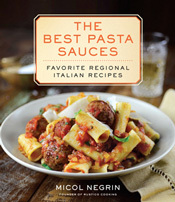 They are available at Italian specialty foods stores. French Du Puy lentils, more readily available in specialty food markets in the US and Canada, can be substituted. Rinse the lentils, pick them over, and set aside. Heat 1 tablespoon of the olive oil in a 2-quart pot and add the onion, celery, carrots, Pancetta, chili, garlic, sage, and thyme. Cook 10 minutes over medium heat, covered, or until the onion is soft and golden, stirring once in a while. Add the lentils and bay leaf, and stir to incorporate. Sauté 2 minutes, stirring gently. Add the broth or water (it should cover the lentils by 1 inch; add more if needed), the tomatoes, and the salt. 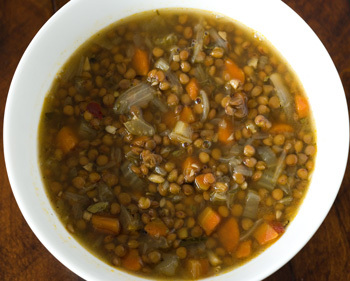 Bring to a boil, stirring, and cover; cook over medium-low heat 1 and ½ hours, or until the lentils are soft but not falling apart, adding a little more broth or water if needed. The consistency should be thick, not soupy. Adjust the salt as needed.